Most people think of water consumption as the amount of water needed for their daily use, i.e. for active consumption. Most don't realise that apart from drinking, bathing, cooking and other direct uses, we consume a lot of water in many indirect ways too. When combined with active consumption, it's known as a Water Footprint: the total volume of freshwater consumed and polluted for the production of the goods and services consumed by the consumer. It is calculated by adding the direct water use by people and their indirect water use. For instance, did you know that your morning coffee is not just a cup of coffee? A lot of water goes into making it consumable: approximately 840 litres to produce just 750 ml of coffee. That's just one pot. Likewise, it takes 90 litres for a pot of tea, 1000 litres for one litre of milk, and a staggering 2500 litres to make just one burger. Now do the math and imagine how much water the world is indirectly consuming every day. 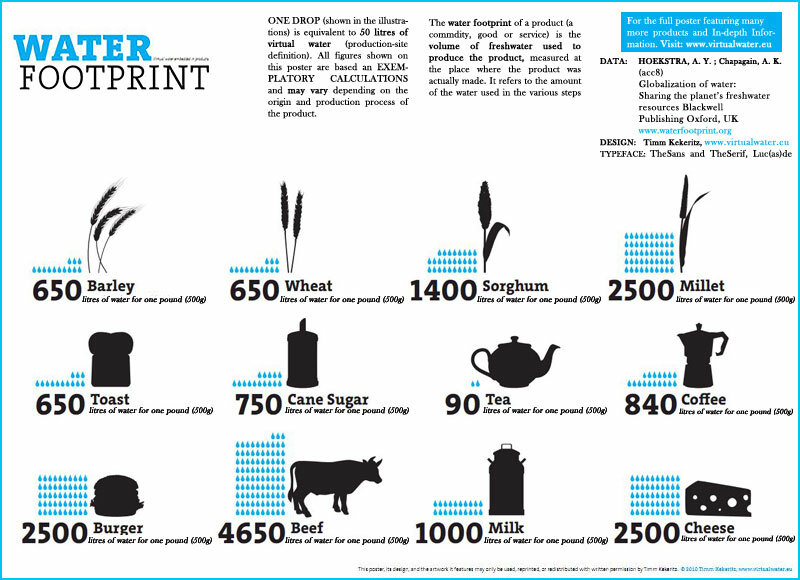 The infographic below, courtesy Virtual Water shows just how much water goes into producing things we consume on a daily basis.